Romantic, decadent, and rich – who knew healthy Valentine’s Day desserts could look this good? For those of you with a huge sweet tooth that still want to stay on the healthy-ish side, we have the perfect solution. 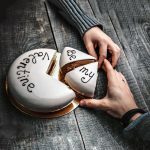 Go on, bake your heart out + treat you and your someone special to the very best this Valentine’s Day! Light and airy, low in carbs, and easy to make, these boozy chocolate soufflés are perfect! Impress your favorite person this Valentine’s Day with this French favorite gone healthy(ish)! Preheat oven to 375F and grease two 8-ounce ramekins with spray, then dust with a small amount of granulated sweetener. In a medium saucepan, whisk cream and confectioner’s Swerve over medium and bring to just a boil. Remove from heat and sprinkle with xanthan gum, whisking quickly to combine. Add chopped chocolate, let sit for a few minutes to melt, then whisk until smooth. Let cool for a few minutes and whisk in egg yolks and Kahlua (or water). Beat egg whites and cream of tartar until frothy, then add granulated sweetener and beat until whites are thick, glossy, and form stiff peaks. Fold in about 1/3 of the egg whites to the chocolate, then carefully fold chocolate mixture back into remaining egg whites until just combined. Divide among prepared ramekins and bake 12 to 14 minutes. 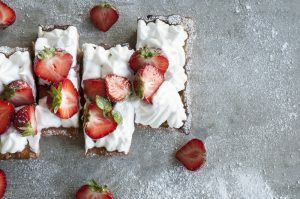 This low-carb & gluten-free meringue bar recipe is a guilt-free favorite for Valentine’s Day! With a lemon crust, tangy filling, and fluffy topping, you’ll enjoy every bite. Melt the butter, then stir in almond flour, sweetener, and lemon zest until fully combined. Bake at 350 degrees (F) for 10 minutes, the remove and cool while you make the filling. Melt the butter in a small saucepan on low heat, then remove from heat and whisk in pureed mixture. Whisk in the egg yolks and return to the stove over low heat, whisking continually until curd starts to thicken. Remove from the heat and whisk in the the lemon juice, xanthan gum, and gelatin until dissolved and smooth. Bake in a preheated 350 degree (F) oven for 20 minutes, remove and reduce oven heat to 325 degrees (F). Combine egg whites and sweetener in a large bowl, then whisk until soft peaks form and the mixture is shiny and stiff. Carefully fold in the strawberry puree, then spread 1/2 the meringue mixture over the strawberry rhubarb curd layer after the 20 minutes of baking. It should completely cover the curd and be 3/4 inch thick. Bake the meringue-topped bars in a 325 degree (F) oven for 10 minutes, then turn off the oven and leave the bars in for an additional five minutes. Despite the unusual green addition to this recipe, avocado actually gives this mousse its to-die-for creamy texture! Plus, with only 1 tsp of honey and TLS® protein in this two-serving Valentine’s Day recipe, you can indulge for the day without overdoing it on unhealthy carbs and fats! 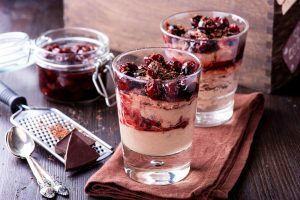 In a blender, combine all ingredients besides chocolate and cherries. Grate over the dark chocolate and top with cherries, to serve. 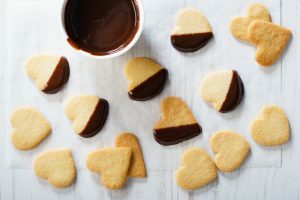 If you and your sweetheart have fun baking together, these dark chocolate-dipped cookies are just the ticket! Packed with protein, you could even indulge in one or two after a duo gym date! Add flour and TLS® Shake, then beat at medium speed until combined. Flatten until dough is about ½ inch thick. Need more Valentine’s Day inspiration to go with your romantic gifts? 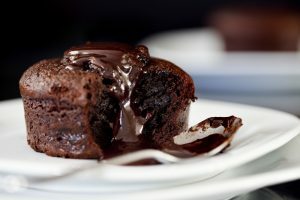 Check out the TLS® Blog for more chocolate recipes!